The dim light of the Cobblestone on a Tuesday night. I love stopping by the Cobblestone on Tuesday nights after yoga class. Tom Mulligan (the proprietor), his son Tomas, and some of his nephews play on Tuesdays. The crowd is small on Tuesdays and the tone of the place is very relaxed. I alway find a good a seat right in the musicians’ corner. Irish musicians often play more than one instrument. 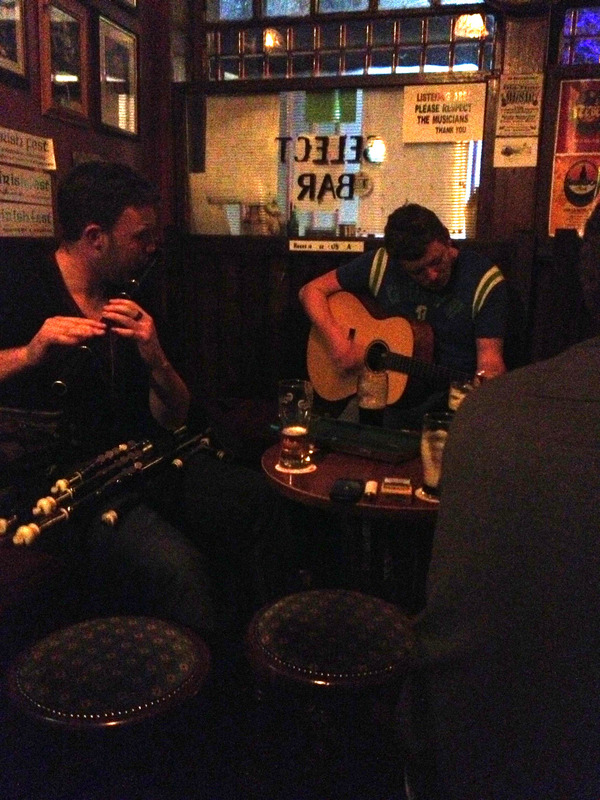 Here you see Tomas on guitar and his cousin playing flute with a set of uilleann pipes on his lap. Whenever I come in on Tuesday, Tom’s playing his flute. When the song ends and he looks up, recognizes me, and exclaims “Shannon!” in the most lovely Kerry accent I’ve ever heard. That warms my heart! Of course, dropping in on the way home from yoga leads to some misconceptions as well. Many people assume that my tall, green bag holds a musical instrument. The musicians and audience alike ask me to join in. Unfortunately, it’s been years since I played the oboe. But with six years of that under my belt, I know that playing well takes tremendous time and dedication. Were I to take up an instrument, it would take years before I’d be ready to play for an audience.